Smart Communities[i] – ITS Field: Jobs of the Future are here now. 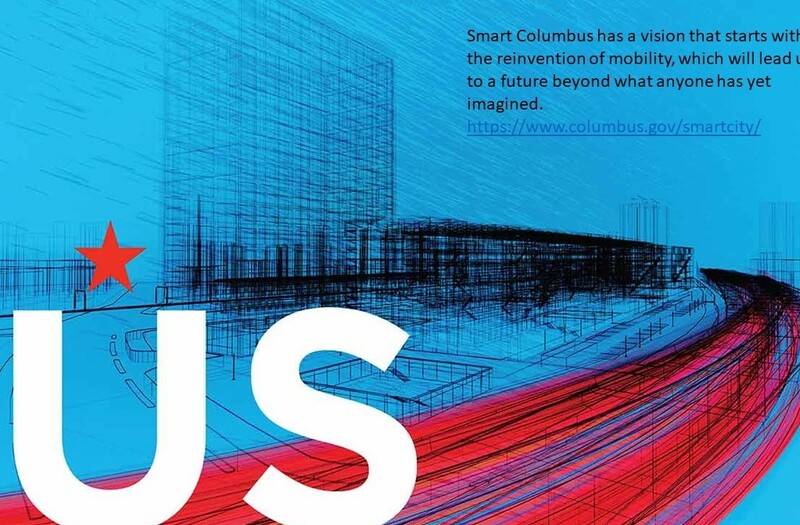 In an effort to address these multiple challenges through technological innovations, the US Department of Transportation (US DOT) developed the ‘Smart Cities Challenge’ which called on “mid-sized cities across America to develop ideas for an integrated, first-of-its-kind smart transportation system that would use data, applications, and technology to help people and goods move faster, cheaper, and more efficiently.”[v] The 78 applicant cities built on existing ideas and an innovative strategies in sustainable urban mobility, including connected vehicles; Intelligent Transportation Systems (ITS) and Transit Signal Priority (TSP) to move people and goods across a city more efficiently; limiting environmental impacts by reducing CO2 emissions and wasted fuel from idling, congestion and poorly timed traffic lights; and work to establish multimodal active transportation options. The applications cited specific efforts, both planned and those underway to address these challenges, noting significant public and private investments, with corresponding needs for qualified workers and new key skills. In the Smart Cities challenge, many common trends were identified, such as, autonomous vehicles, dynamic parking management, and shared mobility. ITS (Intelligent Transportation Systems), emerged as a critical field for investigation, within and the beyond the Smart Cities efforts. This research is focused on traffic signal management, and more broadly on vehicle-to-infrastructure (V2I) technology as a way to address mitigating pollution and more efficient movement of people and commerce through a city. As a transportation technology, ITS improves safety and mobility, and reduces environmental impacts for its users. [vi] Initial review of actual and proposed investment plans found many cities and municipalities investing in updating their ITS infrastructure, as well as adding new infrastructure projects. No career pathway is viable unless there is evidence of growth and investment in the sector. In the case of ITS, Denver, Pittsburgh, and San Francisco (Smart City Challenge finalists) each received grants to implement smart traffic management technology including TSP and connected vehicle technologies. In addition to these cities, the US DOT ITS site identified three pilot projects for Connected Vehicle (CV) deployment worth more than $45 million – the New York City Pilot, Tampa-Hillsborough Expressway Authority (THEA) Pilot, and the Wyoming DOT Pilot. [vii] Miami-Dade County is investing in a multimillion dollar modernization program to improve traffic signal coordination and move the county toward intelligent traffic signals. [viii] In Chicago, the Regional Transportation Authority (RTA) and Chicago Transit Authority (CTA) are implementing TSP on bus corridors in the region with a $36 million grant from the federal Congestion Mitigation and Air Quality Improvement Program (CMAQ) and $4 million in a local match. [ix] In March 2017, the Maryland Transit Administration (MTA) announced that it will invest $11 million to install TSP sensors on local buses and city traffic signals to increase the flow of buses through city streets. [x] This short list of infrastructure investments begins to document a growing trend that is transforming traffic management systems, a core element in Smart Community build outs. The next question is whether there is a qualified and sufficient workforce to support those systems improvements, maintenance and operations in the coming decades. New and continued training for ITS employees at all levels (big data, traffic operation technicians, transit engineers, etc.) will need to be expanded and updated to meet the challenges of this changing technology. Employment opportunities in the Intelligent Transportation System sector are varied, ranging from line installers and traffic technicians to ITS technicians and controls engineers to deal with the safety, mobility and environmental challenges of transportation. Jobs exist from entry level line installers and repairers to traffic technicians and engineers, to higher-level positions in system design, system management, and data security. It is projected that the ITS value chain will contribute over 564,000 jobs in North America – an increase of 14 percent over 2009 levels. [xi] While many of the entry-level operations and maintenance jobs require a high-school diploma with some post-secondary training/certification, workers looking to advance in the field will need to participate in apprenticeships, career and technical education, or additional on-the-job training in order to gain more competency and keep up with technological advances in the field. Stackable credentials toward Associates and higher degrees with be an important part of a future career path. Emerging occupations, or re-structured occupations are developing as investments are increasing demand for workers with new combinations of skills and knowledge to advance “Smart” goals in communities around the country. The NTCPI project has developed a generic pathway to explore opportunities in this field. The transportation career competencies listed below illustrate some core functional skills for employees to have as they move along the ITS career pathway. In addition to the core competencies, employees will need more specific technical skills and training as they move out of entry-level positions into mid-level jobs and across career lattices to other sectors of transportation. Knowledge of electricity, electric wiring, fiber optics, wireless communications and traffic signal operation. Knowledge of the Manual on Uniform Traffic Control Devices (MUTCD), and National Electric Code. Knowledge of Maintenance of Traffic (MOT) standards. International Municipal Signal Association (IMSA) Traffic Signal Certification. Additional growth opportunities are emerging for ITS jobs in post-secondary training programs. The following program examples highlight four different levels of ITS training, from community college to post-graduate degree certificates. These opportunities allow workers to stack credentials as they move through different jobs in the field of ITS. Employment in Smart Community ITS can begin at the level of a traffic technician, and with additional training a worker can move up through the ranks to a Traffic Systems Technician, Senior ITS Technician, or Traffic Operations Engineer. Local and state investments in ITS, sustainable transportation alternatives, and smart mobility hubs will continue to contribute to economic growth and employment. Chicago’s Regional Transit Authority (RTA) secured a $36 million federal Congestion Mitigation and Air Quality Improvement Program (CMAQ) grant and $4 million in local match funds for the regional Transit Signal Priority (TSP) Implementation Program. “Intelligent traffic signals coming to Miami-Dade.” This is part of a multimillion-dollar modernization program to upgrade the almost 3,000 traffic signals in the county. Pittsburgh – nearly $11 million to deploy smart traffic signal technology along major travel corridors. San Francisco – nearly $11 million to implement CV technologies to allow the signal system to detect red light-violating vehicles and adjust timing, and personal wireless devices to prioritize pedestrian travel and safety at intersections. [i] We have expanded the definition of Smart Cities to the term Smart Communities in order to include smaller cities and towns that use multiple technologies to help solve transportation issues. [ii] Schrank, David; Eisele, Bill; Lomax, Tim; Bak, Jim. “2015 Urban Mobility Scorecard.” Texas A&M Transportation Institute and INRIX. August 2015. Web. 13, April 2017. [iii] “Traffic Safety Facts.” US DOT National Highway Traffic Safety Administration. 2016. Web. 13 April, 2017. [iv] Schrank, David; Eisele, Bill; Lomax, Tim; Bak, Jim. “2015 Urban Mobility Scorecard.” Texas A&M Transportation Institute and INRIX. August 2015. Web. 13, April 2017. [v] “Smart City Challenge: Lessons Learned.” US Department of Transportation. 2017. Web. 13 April, 2017. [vi] “ITS Strategic Plan: 2015-2019.” US DOT Intelligent Transportation Systems Joint Program Office. 2015. Web. 17 April 2017. [vii] “Connected Vehicle Pilot Deployment Program.” US DOT Intelligent Transportation Systems Joint Program Office. 2016. Web. 17 April, 2017. [viii] Chardy, Alfonso. “’Intelligent’ Traffic Signals Coming to Miami-Dade.” Miami Herald. 2 April, 2016. Web, 13 April, 2017. [ix] “Regional Transit Signal Priority (TSP) Implementation Program”. Regional Transportation Authority Mapping and Statistics. 2017. Web. 13, April, 2017. [x] Campbell, Colin. “MTA to Install $11 million in Traffic Light Sensors to Prioritize Buses in Baltimore.” The Baltimore Sun. . March 29, 2017. Web. 13 April, 2017. [xi] “University Programs in Intelligent Transportation Systems (ITS): The Evolving Transportation Engineering Discipline.” US DOT Intelligent Transportation Systems Joint Program Office. November 2015. Web. 13 April, 2017.